NHS West Lancashire Clinical Commissioning Group (CCG) is working in partnership with the other seven CCGs in Lancashire to review clinical policies across the region. The eight CCGs across Lancashire have all agreed that there is a need to review and where necessary update their policies in order to; ensure a consistent and fair approach, develop a set of principles and policies against which decisions about care and treatment can be made and to develop collaborative policies across the eight CCGs in Lancashire. In order to ensure that the polices are consistent and offer a fair approach across the county, a working group consisting of representatives from each of the CCGs, along with Public Health Consultants and other health representatives, have agreed to review and wherever possible develop joint polices across Lancashire. These clinical policies, inherited from Primary Care Trusts, although broadly similar, have offered different approaches and rules. The CCGs recognise that this can lead to confusion and potentially unintended differences in services across the area. 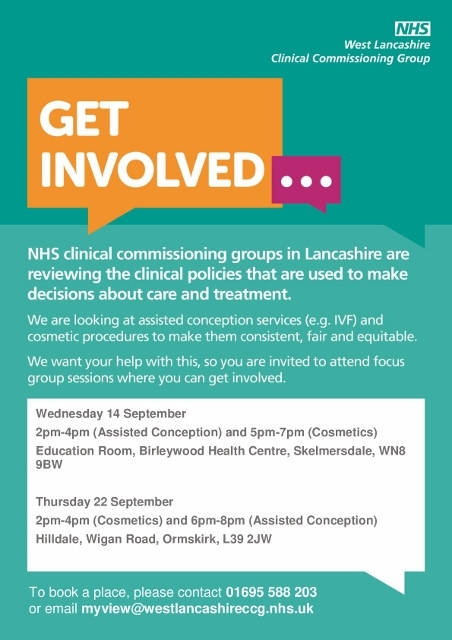 Residents of West Lancashire are therefore invited to attend a number of focus group sessions to learn more about these revised clinical policies and give their views on them. The comments made will be fed back to the CCG and the working group. Free parking is available at all events and any resident wanting must book a place on the focus group of your choice as space may be limited. For anyone unable to attend a focus group session to discuss the policies, a detailed survey will be made available shortly and shared across the CCG’s social media channels and website. “West Lancashire CCG is responsible for commissioning a wide range of clinical services, including secondary (hospital), community and mental health services and for paying for those services, for and on behalf of, the local population. In some areas this also includes commissioning GP services. “We need to ensure this is done in an open, fair and transparent manner but in so doing we must take into account the limited resources we have. To register your interest to attend one of these events, please contact myview@westlancashireccg.nhs.uk or 01695 588 203 with the date and time of the session that you would like to attend.